Your oral health care is essential to your overall health. Many people brush and floss daily and think that they are doing everything possible for a healthy smile. But there are other things you can do to improve your smile. These four secrets by Eugene Oregon kids dentist Dr. Kirchmeier, can help improve your smile. There are many adults who feel dental anxiety and it can prevent them from visiting the dental office for routine cleanings. If you feel fear when you think about visiting the dentist it is important to address it. Many adults who have dental anxiety don’t realize the learned behavior. Many children pick up these anxieties and learn to fear the dentist as well. By looking at your own fear you can feel more grounded and less anxious when you visit your dentist. Most people will see your smile when they first meet you. A first impression is important and when you smile it always makes a good one. People who smile are happier and usually have more self-confidence. If you are embarrassed about your smile or you want more confidence call us to set up a cosmetic consultation. 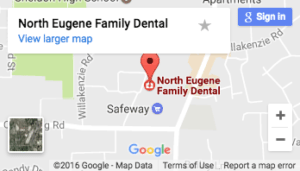 There are many economical ways to improve the quality of your smile, dentist in Eugene Oregon Dr. Kirchmeier can help. For a more proactive approach to your health, chew sugar free gum. It can help increase saliva flow in the mouth, which in turn can reduce cavities. If you chew gum often you can pick a new flavor so you don’t get bored with chewing. Pick a flavor that you might enjoy and chew it between meals. Chewing gum can help reduce cravings as well.